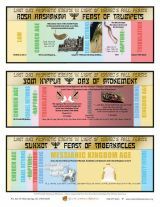 The Fall Feasts – Trumpets, Yom Kippur, Tabernacles – illustrate coming prophetic events in God’s timeline. This 8.5″ x 11″ glossy stock print has a wealth of information in an attractive design. Get one for your own study, or for use in Sunday school or Bible studies.